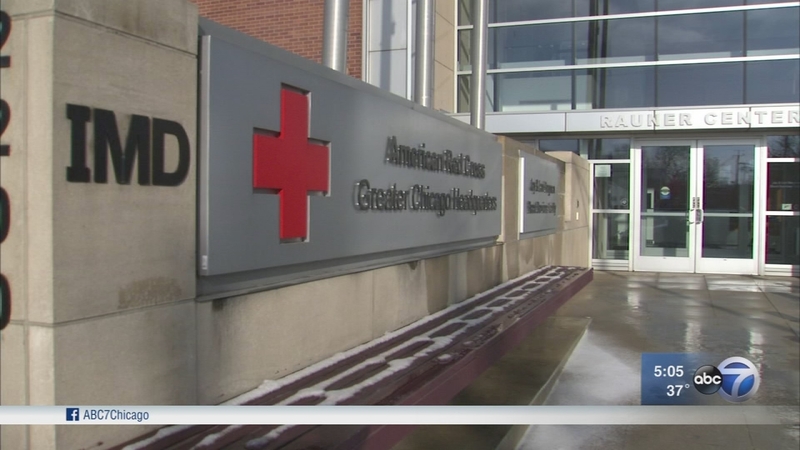 CHICAGO (WLS) -- The American Red Cross said the severe winter weather has had a critical impact on blood donations. Some of the shelves are bare in the storage room where the Red Cross keeps its blood supply. The shortage has prompted the organization to put out an urgent call for blood and platelet donors this winter. "This November, December, we were 28,000 units less than what we normally collect in other months. . . What happens during the holiday season is that people are very busy and the last thing on their mind is 'Oh, I'm going to donate blood,'" said Raul Mora, American Red Cross. He added that the severe cold weather forced the cancellation of more than 150 blood drives. Flu season has also kept many donors at home. Even missing a couple of days of blood collections can result in a drop in inventory, according to the Red Cross. "We have to collect approximately 13,000 units a day to meet the demand in the country," Mora said. The Red Cross is hoping to build the supply up on Wednesday. The organization is teaming up with ABC7 for the Great Chicago Blood Drive. Blood drives are the main source of the Red Cross' supply. Serving local hospitals, like Stroger Hospital, is the first priority. Trauma surgeon Dr. Freeric Starr is hopeful people will come out on Wednesday to give blood. "That blood doesn't just stay here locally. That blood can be distributed nationally as well," said Dr. Starr. The Red Cross has the capability to move blood products to where they are needed the most. The ABC 7 Great Chicago Blood Drive will be held Jan. 10 at two locations -- Merchandise Mart, 222 W. Merchandise Mart Plaza in Chicago; and at the Drake Oak Brook Hotel, 2301 York Rd. in Oak Brook. Hours at both sites are 7 a.m. to 6 p.m.